Posted on June 26, 2017 by Ava G.
As a sequel to the first Guardians of the Galaxy film, this movie is very well done. Though, it is not quite as great as the first movie because, while a sequel is almost never as good as the original, it is still an amazing movie! The soundtrack, like the original, is amazing. It is filled with classic 70’s rock songs that really just help make the movie. Personally, I think this movie has one of the best movie soundtracks compared to some more recent movies. 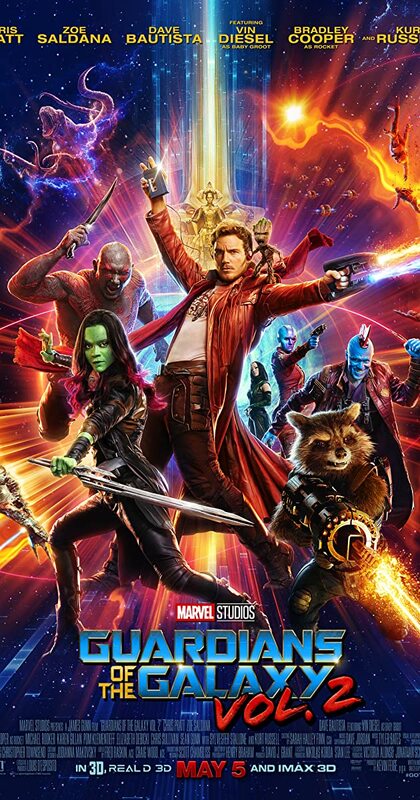 In this movie, you get to follow yet another one of the Guardians of the Galaxy’s adventures to save the universe. With Rocket’s and Peter Quill’s constant bickering (because why should a raccoon be flying a plane when you have a pilot, right?) and snarky comments from the entire team, the movie is definitely hilarious. The movie starts off with the Guardians of the Galaxy protecting some precious batteries from a monster trying to steal it but, after protecting it, Rocket being Rocket decides to steal one — which results in the team pretty much being chased by people who are trying to kill them. Meanwhile, Peter Quill finally learns a little bit about his past, which eventually turns into someone trying to take over the world and the team having to save it. This is the perfect movie for anyone who loves the superhero genre and it is also the perfect movie to go out and see with friends.